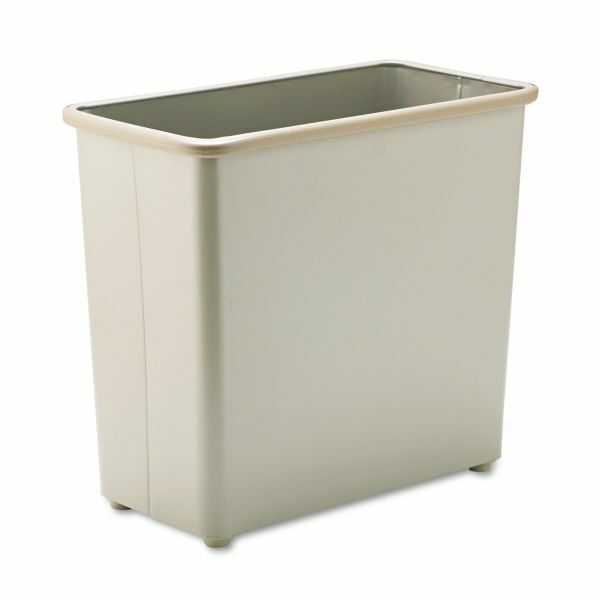 Safco Rectangular Wastebasket, Steel, 27.5qt, Sand - Rectangular wastebasket is excellent for use under or beside a desk or workstation. 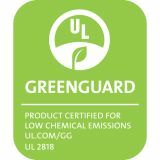 Also great in a classroom, mailroom, break area, training room, storage areas, supply room, IT/Server room, in the media center, library, at a print station or trade show. 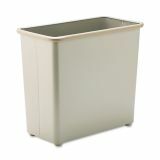 Sturdy, fire-safe, puncture-resistant, heavy-duty steel wastebasket features color-coordinated vinyl bumper tops and no-mar, no-show polyethylene feet to protect furniture and floors from unsightly scratches. Bottom is raised 1 to provide air cushion insulation in the event of a fire. Steel construction offers a durable, powder-coat finish. Wastebasket meets all OSHA requirements for waste receptacles and qualifies under NFPA Life Safety Code 101, Section 31.